After payment, I will ship within 3 business days. You only pay for the first item the rest ship free! These items will have to pay shipping charges on each item. You will have to pay the total shipping charge; however I will combine the item into one package. Once the exact price is known, a refund will be sent via PayPal. Note any stamp purchases will be free. I always declare packages for $10 to reduce the tariffs needed to pay and speed up delivery to you. I will only change this if there is an express request to change this value in the notes upon sale. Declaring larger values on the package I send will not change my shipping charge! You may return items within 30 days. Please contact me in advance. The buyer is responsible for return postage. I will return the price of the item, shipping costs will not be returned. We sell stamp, covers, supplies and other materials related to stamp collecting. Our goal is your satisfaction. We offer a generous return policy. Wish lists are welcome and we will do our best to fulfill your needs. Additionally, from time to time we will offer coins and related materials. A variety of fine jewelry is offered. Precious and semi-precious gemstones, pearls, amber, and so on set in silver and gold. These pieces are stunning and will make a great addition to any woman's or man's jewelry accessories. We do custom pieces and will make unique one of kind jewelry. Please contact us and we can design a piece for you. This is a used single stamp from the USA issued in 1890, #222. 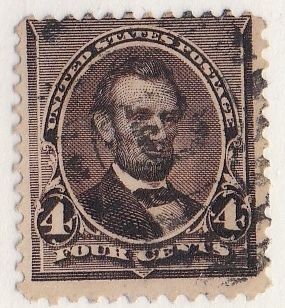 This historic stamp is a picture of Abraham Lincoln.